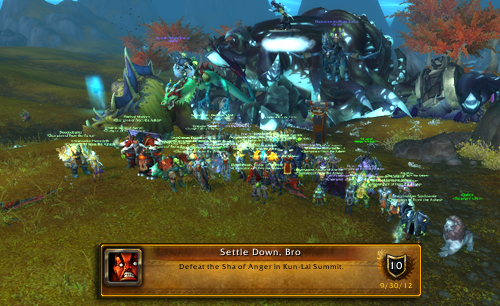 Tonight the guild got together and killed the Sha of Anger in Kun-Lai Summit. First he spawned up on the Burlap trail, but before everyone could gather he moved to near the Yak wash. We made good progress. Wiped only once and then killed him. The entire time a small group of Allies taunted us. But luckily no one flagged and we were able to kill him withough incident. We had a 40 player raid. About half of who were level 90. The rest were between 87 and 89. Main tank took the boss, 2 Off tanks took the adds. Groups 1-5 DPSed the boss while the 6,7, & 8 took care of the adds. When a member becomes mind controlled either CC them until it wears off, or DPS them down below 50% health to break the Mind Control. Avoid the clouds and adds as much as you can. My raid team, the Gangsta Gerbils, starts raiding Tuesday night in Mogu’shan Vaults. Can’t wait.